Time elapsed is not by itself a reason to eschew dental implants. 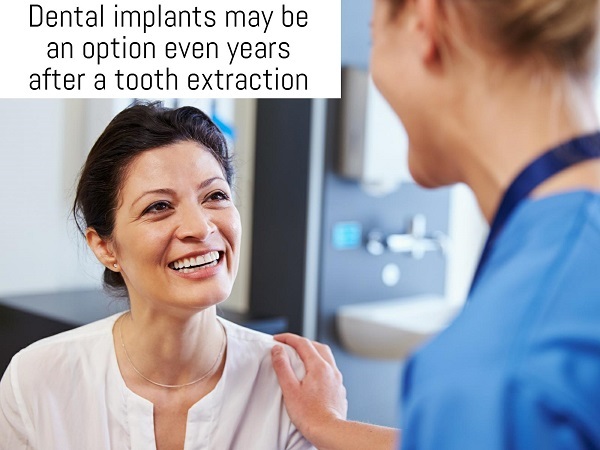 If you have had teeth extracted 2, 5, 10 or any number of years ago, and have not replaced them since, you may still be a good candidate for dental implants. It primarily comes down to a question of bone density. When you are missing a tooth – by way of extraction or otherwise – that tooth root is no longer stimulating the bone beneath your gums. In the absence of a tooth root, the bone will eventually begin to shrink. If the loss of bone mass is substantial in the area, it may affect your implant candidacy. Dental implants require healthy bone in order to be placed; however, even if the bone tissue has shrunk, a bone graft may be an option to restore it. You can rely on the dentists at Aspenwood Dental Associates to provide you with clear, honest, straightforward information about your options. We pride ourselves on ensuring our patients know each and every option. If dental implants will work, we will let you know. But we will also let you know if dentures, dental bridges or any other options will work. Our dentists can help you weigh your options so that you are confident you are making the best choice. Truly, the only way to know if you are a candidate is to visit the dentists at Aspenwood Dental Associates and Colorado Dental Implant Center. To arrange your FREE dental implant consultation, please call our experienced staff at 720-400-8546. We proudly serve Aurora, Denver and all of the surrounding areas.